If you were to discover that a fundamental component of human biology has survived virtually intact for the past 25 million years, you'd probably be quite confident in saying that it is here to stay. 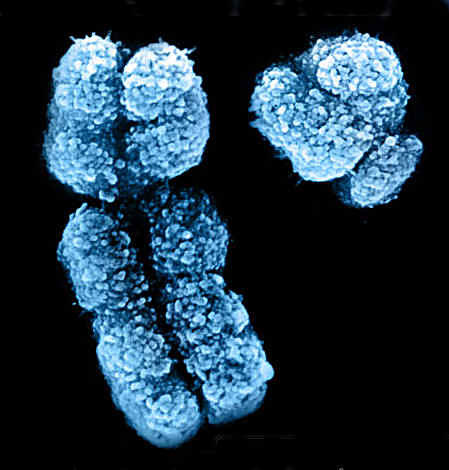 Such is the case for a team of Whitehead Institute scientists, whose latest research on the evolution of the human Y chromosome confirms that the Y—despite arguments to the contrary—has a long, healthy future ahead of it. Proponents of the so-called “rotting Y” theory have been predicting the eventual extinction of the Y chromosome since it was first discovered that the Y has lost hundreds of genes over the past 300 million years. The rotting Y theorists have assumed this trend is ongoing, concluding that inevitably, the Y will one day be utterly devoid of its genetic content. Over the past decade, Whitehead Institute Director Dr. David Page and his lab have steadily been churning out research that should have permanently debunked the rotting Y theory, but to no avail. "For the past 10 years, the one dominant storyline in public discourse about the Y is that it is disappearing," says Dr. Page. "Putting aside the question of whether this ever had a sound scientific basis, the story went viral—fast—and has stayed viral. I can't give a talk without being asked about the disappearing Y. This idea has been so pervasive that it has kept us from moving on to address the really important questions about the Y." To Dr. Page, this latest research represents checkmate in the chess match he's been drawn into against the "rotting Y" theorists. Members of his lab have dealt their fatal blow by sequencing the Y chromosome of the rhesus macaque—an Old World monkey whose evolutionary path diverged from that of humans some 25 million years ago—and comparing it with the sequences of the human and chimpanzee Y chromosomes. BioQuick News recently had the opportunity to speak with Dr. Lawrence Wangh about the novel technology of LATE-PCR (LATE stands for Linear After The Exponential) (see references 1-3 below). Dr. Wangh is professor of biology and director of the Laboratory of Molecular Diagnostics and Global Health at Brandeis University near Boston. 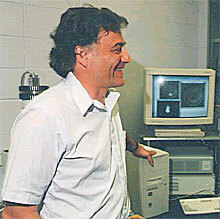 Over the past ten years, he and his laboratory colleagues have invented LATE-PCR and a suite of allied technologies. Dr. Wangh said that LATE-PCR is an advanced form of non-symmetric PCR that overcomes many of the limitations of conventional (symmetric and asymmetric) PCR. These limitations are particularly evident in samples containing low numbers of initial targets. LATE-PCR makes efficient use of a limiting primer and an excess primer that together cause the reaction to abruptly switch from efficient production of double-stranded to single-stranded DNA, when the limiting primer is used up. This is of great utility because single-stranded amplicons can be readily probed at end-point over a broad range of temperatures. This, in turn, allows for the use of probes that hybridize to target sequence variants at different temperatures. LATE-PCR assays are further enhanced by use of PrimeSafeTM, a proprietary reagent that suppresses all forms of mis-priming throughout amplification and makes it far easier to build highly multiplexed reactions. In addition, the lab has recently invented ThermalightTM Lights-On/Lights-Off probes that allow several different long target sequences to be scanned for sequence variants, each in a different fluorescent color. Dr. Wangh said that LATE-PCR makes it possible to build highly informative cost-effective, closed-tube assays for detection of mutations in hundreds of nucleotides. An international team of scientists in Japan, Switzerland, and the United States has confirmed that combining chemotherapy and immunotherapy in cancer treatment enhances the immune system's ability to find and eliminate cancer cells, even when the cancer-associated proteins targeted by the immune system are hidden behind the cancer cell membrane. In a study published online on February 8, 2012 in Cancer Research, the scientists show that antibodies, which have been successful in treating certain types of cancers, can effectively reach elusive intracellular targets, delaying tumor growth and prolonging survival when combined with chemotherapy. "The study provides proof-of-principle for a powerful new strategy that may greatly expand the arsenal of potential targets for cancer drug development and that could be broadly applicable to many different cancer types," said Dr. Hiroyoshi Nishikawa, a Cancer Research Institute (CRI)-funded associate professor in the Department of Experimental Immunology at the Immunology Frontier Research Center, Osaka University, and a senior author on the Cancer Research paper. The introduction of antibodies against cancer represents one of the biggest successes of cancer therapy over the past 20 years. These treatments work by targeting markers on the surface of cancer cells, and include the blockbuster therapies Herceptin, which targets the HER2/neu marker on breast cancer cells, and Rituxan, which targets the CD20 marker on B cell lymphoma. The majority of markers that can distinguish cancer cells from normal cells, however, are found exclusively inside cancer cells, where antibodies typically cannot access them. In a new study published online on February 12, 2012 in Nature Biotechnology, researchers from China’s BGI, the world's largest genomics organization, reported the evidence of extensive RNA editing in a human cell line by analysis of RNA-seq data, demonstrating the need for new robust methods to identify important post-transcriptional editing events. RNA editing is a normal, but not yet fully understood, process in which small nucleotide changes occur after DNA has been transcribed into RNA. It is an integral step in generating diversity and plasticity of cellular RNA signature as a post-transciptional event that recodes hereditary information. RNA editing is an important area in the post-genomic era for its role in determining protein structure and function. It has become increasingly important in genetic research. Last year, a study published in Science (Li et al. Science, May 19, 2011) reported a large number of sequence differences between mRNA and DNA in the human transcriptome. This finding was startling because it implied that there might be a still undiscovered mechanism of 'RNA editing' that could disrupt the central dogma and affect our understanding of genetic variation. However, this view was strongly contested by other scientists because of the technical issue and lack of academic rigor, such as sequencing error or mis-mapping. In this latest study, BGI researchers developed a more rigorous pipeline for approaching these problems and answered some of the concerned questions, which contributed to paving way for the further studies of this field. The researchers obtained the whole-transcriptome data by RNA-seq from a lymphoblastoid cell line of a male Han Chinese individual (YH), whose genome sequence was previously reported as the first diploid genome of Han Chinese. In a study presented February 11, 2012 at the Society for Maternal-Fetal Medicine's annual meeting, The Pregnancy Meeting ™, in Dallas, Texas, researchers reported findings that show that short therapy with the anti-diabetic medication Pioglitazone can prevent the long-term effects of maternal obesity on offspring. This study, “Pioglitazone Therapy in Offspring Exposed to Maternal Obesity,” is the first step toward the long-term goal of preventing metabolic syndrome and obesity in children secondary to maternal obesity. The data proposes a potential role for drugs that activate peroxisome proliferator-activated receptors in the prevention of metabolic syndrome in adult offspring of obese mothers. "Obesity in children, which is on the rise, predisposes them to lifelong diseases such as diabetes, high lipid levels, hypertension, and cardiac diseases," said Dr. Egle Bytautiene, with The University of Texas Medical Branch, Obstetrics and Gynecology, Galveston, Texas, and one of the study's authors. "A large part of obesity in children is programmed during pregnancy and our study shows that a drug used to treat diabetes in adults can prevent the long-term effects of maternal obesity on the offspring, even when used for a short period of time after birth." Dr. Bytautiene and her colleagues placed mice on a high-fat diet for three months prior to, and during pregnancy. The resulting pups were weaned to a regular diet. Pups were randomly selected to receive Pioglitazone or a placebo. Treatment was given once daily from 10 to 12 weeks of age. Immediately before and after the treatment period, the offspring were weighed, their visceral adipose tissue was evaluated using computed-tomography, blood was collected for fasting glucose and triglyceride analysis, and intraperitoneal glucose tolerance tests were performed. National Institutes of Health researchers and their colleagues have identified how resveratrol, a naturally occurring chemical found in red wine and other plant products, may confer its health benefits. The authors present evidence that resveratrol does not directly activate sirtuin 1, a protein associated with aging. Rather, the authors found that resveratrol inhibits certain types of proteins known as phosphodiesterases (PDEs), enzymes that help regulate cell energy. These findings may help settle the debate regarding resveratrol's biochemistry and pave the way for resveratrol-based medicines. The chemical has received significant interest from pharmaceutical companies for its potential to combat diabetes, inflammation, and cancer. The study appears in the February 3, 2012 issue of Cell. "Resveratrol has potential as a therapy for diverse diseases such as type 2 diabetes, Alzheimer's disease, and heart disease," said lead study author Dr. Jay H. Chung, chief of the Laboratory of Obesity and Aging Research at the NIH's National Heart, Lung, and Blood Institute. "However, before researchers can transform resveratrol into a safe and effective medicine, they need to know exactly what it targets in cells." Several previous studies suggested that resveratrol's primary target is sirtuin 1. Dr. Chung and colleagues suspected otherwise when they found that resveratrol activity required another protein called AMPK. This would not be the case if resveratrol directly interacted with sirtuin 1. In the current study, the researchers methodically traced out the metabolic activity in cells treated with resveratrol and identified PDE4 in the skeletal muscle as the principal target for the health benefits of resveratrol. By inhibiting PDE4, resveratrol triggers a series of events in a cell, one of which indirectly activates sirtuin 1.